Blogs, Vlogs, Instagram, Advertising. These days, there are many more ways to make money online than simply flogging goods for cash. In fact, there are a whole host of ways people monetize their websites, from advertising to donations. If you are looking to buy or start an online business, it is important to get to grips with how different business models actually work. And which will best suit your skills. This article will walk you through the most common ways that people make money from websites, and provide you with the building blocks to start doing it too. The first step to monetizing a website is to create traffic to your website. No monetization method will be of any use if no-one actually visits your site. Turning that traffic into cold hard cash. So, what are the different ways to get traffic to a website? And how easy is it to put them into play? Think of the sites you visit the most. Gmail? Twitter? You probably type the website straight into the browser. This is direct traffic. You can grow direct traffic by building loyalty with customers over time, and creating an indispensable service, product, or resource that will keep people coming back. Referral traffic refers to people that arrive at your site through clicking an external link. The link could be placed anywhere on the web, be that a partner site in your niche, or a press release. You can increase your amount of referral traffic by increasing the number of links to your site around the web. Building a brand identity on social media has become one of the most effective ways of marketing a business. Social traffic works like referral traffic, as visitors can be directed to your sites directly through links in the content you share. Social Media can also help you grow your organic traffic, as through sharing quality content that naturally attracts people, you can improve your search engine rankings. You can grow social media traffic by posting engaging and easily shareable pictures, videos, and other content on social media platforms such as Facebook, Instagram, and Twitter. Check out this infographic by The Sushi Digital Team for a more in depth look at your social media strategy. Organic traffic is when people find a website from the results in search engines like Google. If someone searches a word related to your site they may come across your website ‘organically’. You can grow organic traffic by creating and publishing high quality content, with keywords for your industry placed throughout. Tools such as Google Adwords Keyword Planner can help you research keywords. Gaining traffic through this method is called SEO (Search Engine Optimization). It can take time to move up search engine rankings, but it pays off longer term, and its free. When you search something in Google or Yahoo, the first few results appear with a little ‘ad’ sign next to them. That means someone has paid for their website to appear at the top of the results. As 75% of people never click past the first page of results on Google, paid traffic can be extremely effective. However, the effects only last as long as you are willing to pay. Pay per click (PPC) programs, like Google Ads. Every time somebody clicks on one of your ads, you pay a small fee. Pay per lead (PPL) programs where someone captures qualified leads for a certain niche, and businesses can buy them. The leads are people who have clicked on an ad and completed a ‘sign up’, filling out some contact details. This infographic by Josiesque highlights the differences between Organic and Paid traffic which may help you decide which method will work best for you. Having looked at the different methods of growing traffic, let’s investigate different online business models, and their monetization methods. How do you convert website traffic into actual revenue? Much like a brick and mortar business, many people make money by selling products online. You can either make, stock, and/ or distribute the products yourself. Consider the start-up and overhead costs such as manufacturing, packaging and shipping costs. Alternatively, you might use a drop shipping business model, where you ship products directly from the manufacturer to the customer. Benefits include low start-up costs and no stocking or shipping issues. However, dealing with inventory and multiple suppliers can be complicated for beginners. Also profit margins can be quite low, especially as many drop ship distributors add extra fees. If you are thinking of starting a drop shipping business, starting a Shopify e-commerce store is one of the easiest and most popular ways to get started. There is the potential for a huge margin on selling your own products as they don’t involve any production or shipping costs, and can be sold an infinite number of times. This model could be good for someone with a low budget, but with the skills and time to write an e-book, for example. But making a quality product that will actually sell, can have hidden costs, for example hiring an editor. You may consider giving away some content for free to draw people in. For example you might offer the first classes of a course for free, and the rest of the course at a cost. If you have a particular skill, whether you are a web designer, accountant, or stylist, you might consider selling your service online. Remember that providing a service is time intensive and there is a limit to its scalability. Marketing is key to growing a service business. If you have the budget, paid traffic ad campaigns can be effective to boost website sales. Advertising has become one of the most popular ways to monetize any website. There are several different ways you can make money through ads. Google Adsense places banners on your site, filling them with targeted advertising for your audience. Every time someone clicks on the ad, you get a small fee. It is easy to set up, but each click is usually only worth a few pennies, so unless you have extraordinary amounts of traffic, it’s hard to make a lot of money this way. The kinds of sites that tend make the most money from Adsense, are free sites with high volumes of traffic. PPV or CPV (cost per view) marketing works by the user downloading some free software (perhaps a tool bar or game). In exchange, the user agrees to install an adware on their PC which shows them various pop up ads, depending on the user’s behavior. This can be a cheap way to advertise, an impression costing as little as $0.01. But it can be a controversial method as ads can seem spammy. Advertisers can pay a lump sum to place a banner ad on your site. This method can be more financially secure than waiting for the pennies to trickle in from PPC ads. You can advertise ad space on your website or post on Buysellads to let people know you are selling advertising space. You can also sell ads directly to advertisers. This way ad agencies, such as Adsense, can’t take a cut, saving you money. This method could work well if you have a valuable, targeted audience. 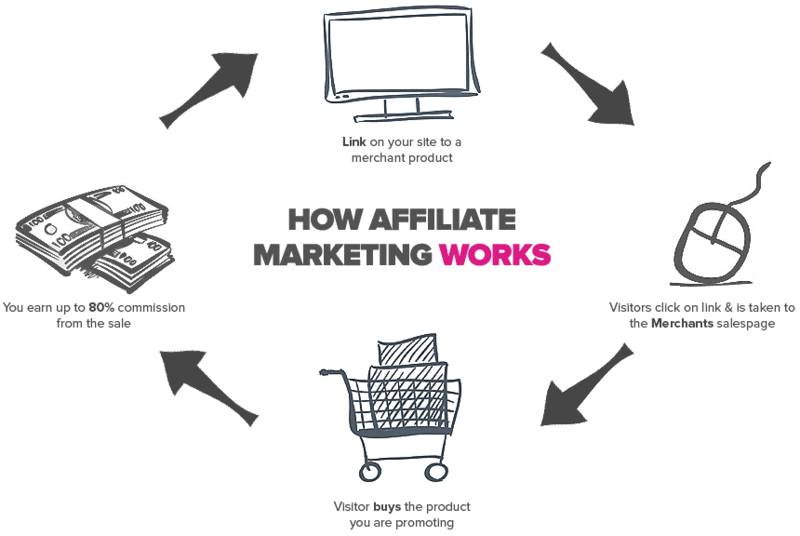 Although affiliate marketing can be confusing, it is worth learning about. It works by you (the affiliate), finding products to promote, and recommending them on your website along with links to the products. If a customer clicks one of the links, and buys the product from the advertiser, you get a commission, which can be up to 70% of the product price. Successful affiliate marketing takes time and work. For people to follow your recommendations you have to build up a trustworthy site with quality content. It is important to chose products that you genuinely like and will be useful to your audience. You can find affiliate products to promote on your website through affiliate programs or networks. Amazon associates is a free affiliate program, easy for beginners. You can browse products to recommend on your site, for up to 12% commission. Membership websites work by people signing up and paying a recurring fee for your service or product. As your customer will pay every month, you need to create consistent content that is worth the membership costs to keep their interest. Many sites start by offering a free plan, then having a premium plan that costs, that provides extra access or benefits. Spotify is an example of a business that deploys this tactic extremely successfully, offering extra features for the premium users. Some people make money by accepting donations from their visitors. This will only really work if you have a small but engaged audience, for whom you provide something of value. Wikipedia, for example, which provides a hugely useful information resource, is funded by donations. It is possible to add a Paypal donation button to your website to take the donations. You can sell a website for a multiple of it’s monthly or yearly earnings. Therefore, this is a viable way to make some cash. Some people buy and sell, or ‘flip’ websites for a living. You can also check out our guide to finding websites for sale that make money. So we have determined which are the most common models people use to grow traffic and monetize their websites. When it comes to doing it yourself, choosing the appropriate methods for your sites and playing to your strengths is a good place to start. Diversifying your traffic sources and monetization methods is then key to creating a consistent flow of income. If you have several traffic sources and income streams, if one fails you will have something to fall back on.